Really nice I tried a sip. Fantastic. I mixed it with a little. Delicious. Really nice at this price level. Panama in a glass! This quickly became my favourite, and remains in my top 5. Delicious, sweet and smooth. Delicious and flavourful Pure Panamanian paradise! Currently, this is available in Ontario Canada. Well worth the money! Now we’re talkin’... No additional ingredients required. Thanks for stopping by! Delicious! Smooth, flavourful, inexpensive... the only hitch is availability. It’s currently only available in 8 states, plus its home of St. Croix. Generally, my go-to. Available full time in Ontario, this is my “usual”. Poured on an ice cube is good, but a little cola or OJ is better. Cheap and delicious In Canada, this is the available entry level for FdC. In CA, there are 3, and 4 year rims available. Best mixed with coke. 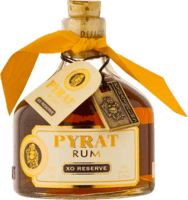 As expected for the price If you’re broke, this is a pretty decent rum! But If you’re not broke... it ain’t too great. Not worth a second sip. I was thoroughly disappointed in this blend. Since I tried this, I’ve tried other blends with similar discord. I didn’t expect it to be... ...quite this bad. It’s like rum mixed with whisky. In order to not waste it, I gave it to a genuine alcoholic.